I'm getting more punctures than I used to, but maybe that's caused by my riding now on worse road surfaces than I used to. The punctures tend to be slow leaks from sharp grit (crushed stone which surfaces an unpaved path) embedding in the rear wheel. Total weight (me and the bike and stuff) is about 200 lb, and the tires are always properly inflated. Is it plausible that the tires are less puncture-resistant than they used to be, i.e. is it worth replacing them now if I want to avoid punctures? How can I tell? Is the fact that they still have tread (aren't worn smooth) proof that they're not worn significantly? Against 'time bombs' such as shards, flints and glass, only a thick rubber belt like Smart Guard will work. Is it possible that the inner belt isn't working as well as it used to? The tires are still very rideable but is it likely that they're now significantly less reliable than when new? The tires of the Marathon family usually last between 6000 and 12000 km. ... The Marathon Plus is outstanding with its extremely high mileage of often much more than 10000 km. 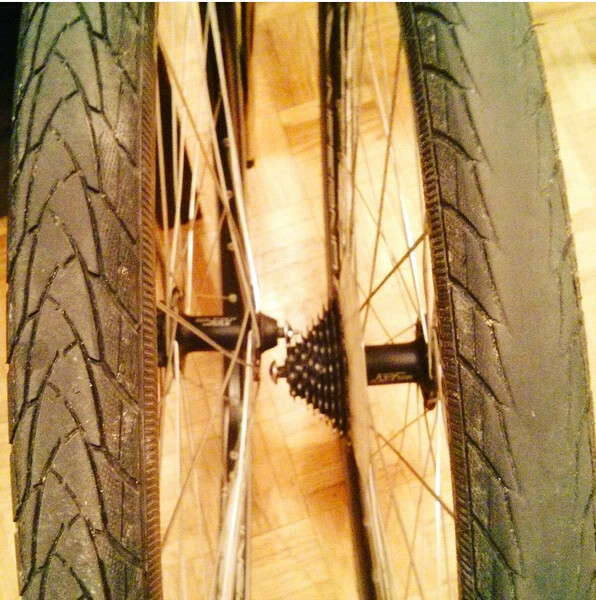 In my experience, tires should be replaced after 4-5 years, regardless of # of miles/KM. The rubber dries out, cracks, and it is easier for debris to puncture old rubber. If this helps at all, I used a set of Marathon Plus tires on a cross-Canada tour last year (8200km), plus a bunch of commutting, totaling about 11,000km. I did not get any flats at any point, but by the end of that distance, the rear tire was pretty bald and I decided to stop using it. Here's a picture of the tires around 10,000km, front tire on the left rear on the right. I consider the rear tire bald here since the part actually contacting the road has none of the factory tread remaining. The Smart Guard is an extra layer of rubber between the road side and tube side of the tire, and depending on tire model it is one of a few non-black colors. I think the Marthon Plus is blue, and they do green on some tires, etc. Inspect your tire carefully in good lighting and see if you can see the colored middle layer anywhere, even a small patch. If so I would chuck the tire since that means you've broken through to the middle layer and the road side of the tire could start delaminating from there. If your tire is bald but you can't see Smart Guard showing through, and you want to keep using it but are getting a lot of flats, check it for small embedded puncturing agents that may be stuck in the tire and puncturing your tubes repeatedly. E.g. on our tour, a couple of the other guys who were also using Marathon Pluses had a run of flats, i.e. one a day for several days. After careful inspection we found a couple of tiny wires, like human hair thickness and 2mm long, embedded in the tire that were almost invisible, but poking through to the inside and putting pinholes in the tubes. We eventually determined they were radial belt wires being picked up from the side of the highway from areas where transport trucks had had blowouts. You can get similar repeated slow punctures from tiny glass slivers. If your tires look like mine (rear very worn and front quite new looking), resist the temptation to swap them between front and rear wheels. A worn tire is a greater candidate for blowouts and other major failures, which in turn are more likely to cause injury when they happen on the front wheel. If you don't want to replace both tires, then chuck the fully worn rear tire, move the partially worn front tire to the rear, and put a nice new tire on the front. More info on this here. I replace mine when I start getting punctures. That's normally some time after I have a strip of blue all the way round, and before there's more than just odd spots of black showing through the blue. I've done that with several of them, and it seems to be pretty consistent. But as Steve says, four or five years might also be a good time to replace them, but since I do quite a few kilometres on my bikes that hasn't been an issue for me. I think I would still be inclined to just run the tyre unless it was obviously cracking up, or I was about to start a long tour and thought the old tyre wouldn't last long enough to be worth taking. Not the answer you're looking for? Browse other questions tagged tire puncture preventative-maintenance or ask your own question. Schwalbe Marathon Plus recurring puncture - options? Schwalbe Marathon Plus and Micheli Protek Max: what are the fundamental differences?